Vinci is one of the world’s largest construction companies employing over 185,000 people. The majority of its business is in France, but it operates in over 100 countries and is expanding its global power, mainly by buying up local subsidiaries. Vinci has been involved in numerous scandals both in France and globally. In Calais, it was responsible for demolishing the Jungle refugee camp and building the anti-migrant wall. In the west of France, Vinci is the concessionaire behind the controversial airport scheme at Notre Dame des Landes, which has led to the “ZAD” resistance movement. In the UK, Vinci was one of the major construction companies that ran the “blacklist” against trade unionists and other workers. In Russia, it is accused of corruption and massive environmental destruction in the Khimki Forest motorway scheme. In Qatar, it is accused of using forced labour. The core of Vinci’s business is running privatised, government-backed infrastructure in highly lucrative “concession” deals. Over half of all its profits come from its extremely profitable concessions to run much of the French motorway system. Out of every four euros paid by drivers in motorway tolls, one euro goes straight into Vinci’s profits. Vinci’s strategy is to seek similar high-profit concession deals in other sectors and other countries. Recent moves include major airport concessions and toll road schemes from Chile to Vietnam. Although Vinci is based just outside Paris, its owners are mainly international investment funds. The two biggest shareholders are US fund BlackRock and the dictatorship of Qatar. Vinci is financially stable and profitable: although building activity has slowed in many of its markets, this is more than made up for by concession mega-profits. The construction businesses are not highly profitable in themselves, but help Vinci secure these deals. One of the fastest growing divisions, Vinci Energies, is the company’s high-tech wing involved in developing “smart” infrastructures which can integrate new surveillance and monitoring technologies into transport systems, cities, and other environments. Vinci’s golden egg, the French motorway concessions, could be vulnerable to political shifts or public discontent. Other vulnerabilities may emerge as the company pursues high-profit deals in new countries, where it needs to create new political alliances with unfamiliar regimes and oligarchies and face new competitors — and possible resistance. Vinci is a multinational infrastructure and construction company based in France. It is one of the world’s largest construction companies, with revenue of €38.1bn in 2016, employing over 185,000 people and operating in over 100 countries. The core of its business is winning highly lucrative “concession” deals, where it builds and runs privatised, government-backed infrastructure such as toll motorways on long term contracts and with profit rates often over 25% of revenue. allegations of using forced labour in Qatar, whose government is one of Vinci’s main shareholders. Vinci is a French registered public limited company, listed on the Euronext stock exchange in Paris, with its head office just outside Paris. (Currently in the suburb of Rueil-Malmaison, but it is building a new head office complex in another suburb, Nanterre.) The majority of its business is in France, although operations are expanding worldwide.However, its owners are mainly international institutional investors based outside France. The two largest shareholders are major US fund manager Blackrock and the dictatorship of Qatar. Vinci was founded in 1899 as Société Générale d’Enterprises. Since then it has grown by acquiring numerous other businesses worldwide, many of which continue to operate under different names. As of July 2016, the group had no less than 1,873 fully owned subsidiary companies, plus another 153 joint ventures. The parent company changed its own name from SGE to Vinci in 2000. In its formal structure, Vinci has two main divisions: concessions, including motorways and airports subsidiaries; and contracting, including construction subsidiaries and the high tech “Vinci Energies” business. Each division has many further subsidiaries. Construction is the biggest segment in terms of revenue by far, with subsidiaries worldwide involved in all kinds of building projects from water, energy, and communications networks to prestige stadiums, public buildings, or private housing developments. But the core of Vinci’s business, and the source of most of its profits, is operating government infrastructure concessions. Above all, Vinci has long term contracts to run over 50% of France’s motorway system, which alone account for about half of total profits. In general, such “Public Private Partnerships” are virtually a government license to print money, and Vinci seeks to win more such deals wherever possible. Besides roads, airport concessions are a particular target area for the company. Vinci’s main predecessor company was Société Générale d’Enterprises SA (SGE), founded in 1899. Over the years, it has grown by acquiring numerous other French and overseas businesses. The company changed its name to Vinci (in tribute to Leonardo de Vinci) in 2000, although many of its subsidiaries retain their old identities. Throughout its history, Vinci has been involved in major infrastructure projects both in France and worldwide. It was part of the consortium of French and British building companies responsible for the Channel Tunnel (actually, three of the Tunnel building companies are now part of Vinci), and built the Stade de France, now the French national football stadium run by Vinci as a concession. Further afield, Vinci worked on the Aswan Dam in Egypt and the Gariep Dam in South Africa (completed in 1971). Below are just a few recent projects that have won particular notoriety. 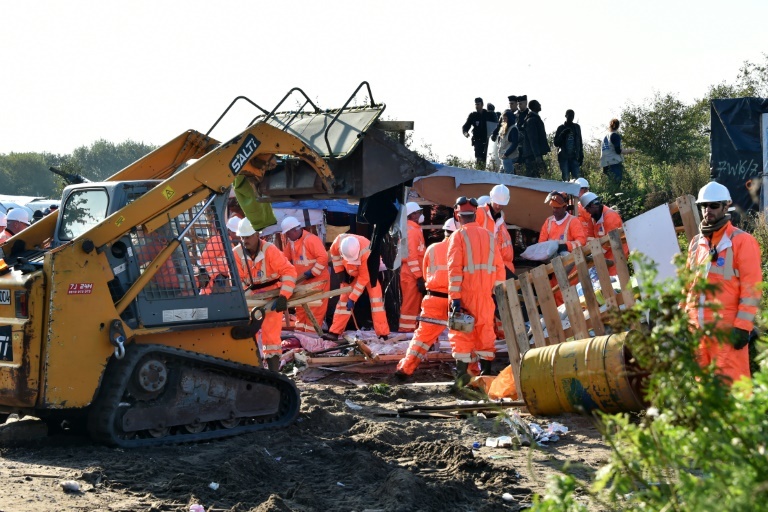 In 2016, Vinci played two key roles in the continuing attacks on migrants at the Calais border: bulldozing homes in the jungle and building the notorious new border wall. It was a local Vinci subsidiary, Sogea Nord Hydrolique, that did the dirty work of destroying and clearing the dwellings of some 10,000 people in the “jungle” refugee camp. Sogea had already been the demolition contractor in the destruction of the southern half of the jungle in February-March 2016, and played the same role again when the whole camp was cleared in October 2016. The destruction was ordered by the French government and overseen by the local Prefect of the Nord Pas de Calais department. It is not known how much Vinci was paid for this job. In the final October eviction, Sogea workers were ordered not to wear company uniforms or distinguishing clothes, in order to try and cover up the company’s role in the eviction. The company’s role was reported, and condemned, by Vinci trade union workers. Sogea/Vinci has a number of offices or depots in the Pas de Calais region. Sogea Nord Hydrolique is based in an industrial estate outside the nearby town of Arras, in the suburb of Anzin Saint Aubin. Another local subsidiary under the name of Sogea Caroni – Vinci has offices in Calais itself and in Lens. Eurovia, Vinci’s main transport infrastructure construction division, is working on the construction of the so-called “Great Wall of Calais”. This is a 4 metre high security wall blocking off the motorway around Calais to the port, funded by the UK government and costing an estimated £2 million. The construction is being overseen by the public-private concession consortium that runs the Port of Calais (called Société d’Exploitation des Ports du Détroit, or SEPD). It is not currently clear how much of the work is being sub-contracted to Eurovia: there is no public announcement, and Eurovia workers and vehicles have been observed at the site alongside employees from other companies. A Vinci Construction subsidiary, called Soletanche Bachy is also part of the consortium awarded a major €675 million contract for work on the expansion of Calais port, supervised by SEPD, although the lead contractor is Vinci’s rival Bouygues. A previous attempt to evict La Zad in 2012 was met with determined resistance and ended up with an international mobilisation to rapidly re-occupy the land. Around 40,000 people rebuilt buildings and repaired infrastructure damaged by the police. In the UK, Vinci was one of around 40 major construction companies that participated in operating a “blacklist” of workers involved in trade union activities, or who might otherwise be potential trouble-makers. The blacklist database listed the names of over 3,000 construction workers, and also some others including anti-fascists and environmental and political activists. There is considerable evidence that information was fed into the database by the police and security services, as well as by employers and by “friendly” trade union officials. The blacklist was maintained by an organisation called “The Consulting Association” (TCA), which was funded and supported by the construction firms. It was set up in the early 1990s, after the exposure and closure of an earlier “anti-subversive” employers’ organisation called the “Economic League”, originally set up in 1919. The main player in founding TCA was another building company, McAlpine, but Vinci played an active role. A Vinci human resources representative named Alan Audley was Vice Chairman of the association when it was itself shut down, in response to media attention and then a raid by the Information Commissioner, in 2009 (according to its “chief officer” Ian Kerr). In 2013, Vinci was one of eight big firms that apologised for the blacklist and launched a compensation scheme, which offered payments of between £4,000 and £20,000. This offer was condemned by unions as “grossly inadequate”, and workers continued to pursue legal action against the firms. In May 2016, the eight companies including Vinci agreed to settle the remaining court cases with the unions, which reportedly involved compensation payments to 771 workers coming to a total of around £50 million. Vinci has very close links with the Qatari regime, which is Vinci’s second largest shareholder. In Qatar itself, Vinci and the regime operate a joint venture called QDVC (Qatari Diar Vinci Construction), one of the country’s main building firms which has won contracts for prestige projects related to the Football World Cup and key transport infrastructure (e.g., Doha orbital motorway and metro line, a new light rail system for the city of Lusail). QDVC is 51% owned by the government company Qatari Diar and 49% by Vinci Construction Grands Projets. It has a workforce including several thousand migrant workers. In March 2015, the French NGO Sherpa filed a legal complaint against Vinci and QDVC alleging it had compiled “overwhelming evidence” of “violations concerning forced labour, servitude and receiving stolen goods in connection with migrants employed on their building sites in Qatar. Investigations carried out on site conclude that these companies are employing various threats to compel a vulnerable population to live and work in undignified conditions for a derisory remuneration.” www.asso-sherpa.org/2022-world-cup-qatar-sherpa-files-complaint-vinci-construction-management-qatar-branch-qdvc One of the key allegations was that Vinci “confiscates” the passports of its migrant workers, effectively holding them in a state of “modern slavery”. Sherpa handed its evidence to the Nanterre public prosecutor, who started an official investigation. Vinci denied the allegations and launched a counter court case against Sherpa for defamation in the Paris civil court. The legal battle was still continuing in late 2016. The Khimki forest is an ancient woodland west of Moscow, traditionally protected as part of the city’s “greenbelt”. However, in 2008 Moscow and Russian state authorities gave the go-ahead for construction of part of the new M11 Moscow – St Petersburg motorway through the middle, and invited bidders for the construction project. In 2009, a consortium called “North West Concession Company” (or ZSCC in its Russian initials) won the deal, a concession to build the route and then operate it as a toll road. Vinci initially was the sole owner of this company, later selling 50% to Mototrest, a Russian company whose owners (through offshore structures) reportedly include various oligarchs amongst which is a close Putin ally called Arkady Rotenberg. The fight for Khimki forest against the motorway scheme became one of Russia’s highest profile ecological struggles, including demonstrations, direct action and protest camps by forest defenders. The resistance was met with violent retaliation: beatings, imprisonment, kidnappings and torture of forest defenders, ecological campaigners and journalists who covered the issue, involving hired neo-nazi gangs as well as police and private security. In 2013, Mikhail Beketov, campaigning founder and editor of the Khimki newspaper, died after a long period in hospital, having suffered major brain damage and other injuries following a severe beating. In August 2010, the forest won a temporary reprieve when President Medvedev bowed to pressure and put the route on hold; but this didn’t last long, and building resumed by the end of the year. Vinci had been lobbying and threatening legal action against the Russian state if the project didn’t resume. The road was finished in December 2014. Russian activists and international NGOs have alleged that Vinci and its concession partners were party to high level corruption in the bidding process. They argue that the ZSCC bid was chosen in an irregular way despite in fact being more expensive than the rival bids, and causing the most environmental damage. Two court cases have been launched by NGOs in France against Vinci alleging corruption: a “preliminary investigation” by the Nanterre prosecutor opened in 2013, and a new case opened in May 2016. Vinci with its partners continues to win more contracts to build and operate Russian motorways. In 2015, a new joint venture company called Two Capitals Highway, 40% owned by Vinci and 60% by other partners including Russian bank VTB, finalised a 27-year deal to build and operate two more stretches of the M11, with the work funded 63% by the Russian government. Vinci’s main objective is to chase high profit public-private concession contracts. As it already has much of the French road concession business sewn up, to expand it needs to find new concession opportunities in other fields. These could be in new sectors, especially airports; and in new regions, from Chile to Vietnam. According to CEO Xavier Huillard: “Our strategic priority is to push ahead with our international expansion”. industrial and financial capacity: ability to fund and carry out major projects, providing a full range of services from design to administration, on its own or with partners. This is why, although Vinci’s construction business is not so directly profitable as its concessions, it remains crucial. In Europe, Vinci has a massive workforce and industrial machine through its construction arm, ready to take on major construction projects and even guarantee much of its own supply lines from its own quarries and other facilities. The scale of its business and revenues also means it has no problem raising finance quickly and cheaply: although its concessions are often highly leveraged (i.e., they have big debts in anticipation of future profits), these would be easily covered by the business as a whole in the event of any upset. So, as Vinci says, its aim is to act as an “integrated concession-construction group”. In addition, the sheer scale of its business creates an extensive web of contacts including with government authorities. In France, for example, Vinci construction subsidiaries are everywhere, involved in all kinds of construction sub-sectors, and may be able to carry out projects cheaply in order to create ongoing relationships which will help bids for more profitable deals. Of course, this web of connections is also supported by high-level political networking, and by “philanthropic” activities, such as running a range of foundations, non-profit initiatives, civil society partnerships, etc. High profile “prestige” construction schemes, e.g., grand hotels, stadiums or institutes, may also help to raise Vinci’s presence and reputation. In new regions, Vinci may wield its global reputation, but cannot rely in the same way on existing infrastructure and contacts. Instead, it will often enter the market by either buying up or forming joint ventures with local companies. It is also likely to try to form political or financial relationships with local leaders and their friends in business, as seen in Russia, Qatar, etc. This is where Vinci has sometimes run into accusations of corruption, as it seeks to build relationships with less “transparent” authorities. Another way to get an advantage in concession bidding is through developing new technologies which help to present schemes as “cutting edge”, as well as to cut costs. The roll out of Electronic Toll Collection (ETC) technologies is important in road concessions. Vinci is also active in developing “smart” infrastructure technologies: “smart roads”, “smart rail”, “smart cities”, etc. The Vinci Energies division is the main experimental arm here. Partnerships with universities, research institutes, etc., also play a role, as may buying up small tech companies or promoting start-ups and “entrepreneurs” through venture capital schemes. Meanwhile, in established markets like France, Vinci’s aim is not just to win new concessions (e.g., more airport deals), but also to get existing contracts renewed. A key “lever” to do this is to lobby for new “investment programmes” to further develop the infrastructure, as in the new French “motorway stimulus” upgrade programme where the state has extended Vinci’s contracts. further experimental technology development, including ETC and “smart” infrastructure. Vinci’s number one profit source is its French motorway toll business. This business is massively profitable, but has some potential vulnerabilities. First of all, it is highly dependent on the French government, and so the French political status quo. The state could cease renewing Vinci contracts, or even end them with a year’s notice using existing buy-back clauses. This could happen if, e.g., there was a political shift away from the public-private model, or perhaps particular scandals involving Vinci. In 2014, there was considerable press and “public opinion” attention on the mega-profits from these contracts. In fact, this only led to some minimal cosmetic adjustments, and in fact contracts have now been extended with the new “stimulus package”, whilst Vinci Autoroutes’ profit rate in 2016 was even higher than before. Second, in principle toll collection is also vulnerable to grassroots non-compliance. Toll collection is widely unpopular, and perhaps even more so where people are aware of the extent of profiteering. In recent years, there have been occasional episodes in France of toll gates being opened or sabotaged during moments of unrest, as well as in other countries where Vinci is active such as Greece. There are historic precedents of more widespread popular movements against toll collection, e.g., the Welsh “Rebecca Riots” in the early 19th century. For sure, nothing on that scale has been seen in Europe in modern times. Also, the spread of Electronic Toll Collection (ETC) technologies involving Automatic Number Plate Recognition (ANPR) may make anti-toll resistance more difficult in future. Vinci’s strategy involves expanding into new regions where it does not have existing presence, and so may not have such strong political relationships or alliances. It may be more vulnerable to campaigns or reputational exposure in these newer sites. For example, Vinci may face stronger competition from local companies, and rivals may oppose Vinci muscling in on their territory; political and legal support for concession profiteering may be less stable, or perhaps local populations may be less accommodating. Vinci is actively developing new “smart” technologies as selling points for its concession bids. New technologies may make business more profitable, but can also introduce unexpected weaknesses, or even provoke public backlashes. NGOs and campaigners have sought to highlight and take legal action on Vinci’s alleged involvement in practices of corruption and modern slavery, e.g., relating to Russia and Qatar. So far these campaigns do not seem to have cost Vinci any political capital with the French government or other major customers. Might they start to do so if campaigns became more concerted, and perhaps adopted new tactics, e.g., targeting Vinci’s “soft” relationships such as NGO and university alliances, etc., where partners may be more susceptible to reputational pressure? Vinci’s construction businesses are its revenue backbone. Profitability has been stagnating as France and some other main markets continue to see low construction activity, and also as oil price falls affect specialist oil and gas construction. However, this low profitability is probably not a major threat to Vinci so long as its concessions bring in the bucks. Also, the construction business is just so big that losing a few contracts here or there, even where these are multimillion deals, does not have a major impact. Vinci is a public company listed on the Euronext stock exchange in Paris. Its owners (shareholders) are mostly large international investment funds. 500 such funds hold around 75% of the stock. The two largest shareholders are US investment firm Blackrock, which currently owns around 5%, and the Qatar Holding fund (of the emirate of Qatar), with around 4%. In general, US funds make up around half of the ownership, with French institutional investors holding some 16%. Apart from institutional investors, at the end of 2015 employee savings funds held 9.4% of the shares, and some 170,000 individual investors between them owned 8.4%. Half of Vinci’s profits go straight to shareholders as dividends, under a 50% dividend policy that has been in place since 2006. The Vinci management team are grey in appearance. All are white, male, in their 50s and 60s and French. Overwhelmingly, they are products of the standard French elite education system, including the “grandes écoles” (grand schools) universities dedicated to producing businessmen and top engineers. (École Polytechnique, École Nationale des Ponts et Chaussées, École Nationale des Arts et Métiers, etc.) Many have had long working careers in Vinci or its predecessor companies. Otherwise, they have worked in similar corporate jobs, and/or in French government and administration. The membership of the board of directors is also largely bland, French and corporate. However, there is also a sprinkling of women, foreigners, and worker representatives. Unlike other companies of this level, there are no real “big fish” ex-politicians on the board. But, as with other major companies, a key role of the board is to gather relationships with corporations, financial institutions, and other key collaborators. One board place is reserved for the representative of Qatar Holdings, a key shareholder and business partner. Other members have connections with institutions including major Russian bank VTB, or French defence conglomerate Thales. The most significant individual is Xavier Huillard, who holds the roles of both Chief Executive and Chairman of the Board. The rest of the management team is made up largely of the heads of the various divisions and main subsidiaries. The main figure on the board after Huillard is vice-chair and “senior board director” Yves-Thibault de Silguy, who has various important connections. Huillard has worked for Vinci, and previously for its predecessor company, Sogea, since 1996. He has been combined Chair and CEO since 2010. Graduate of the École Polytechnique and the École Nationale des Ponts et Chaussées, “has spent most of his working life in the construction industry in France and abroad”. He previously worked at rival firm Eiffage, where he was seen as the protégé and destined successor of its boss Jean-François Roverato. On becoming Vinci president in 2006, he made the unusual step of publicly denouncing financial “abuse” by his predecessor Antoine Zacharias, whom he succeeded as part of a boardroom coup. According to friendly business media, he is a “charmer” who sings opera in the office and is well-liked by his staff. Permanent representative of VINCI on the Board of Directors of Aéroports de Paris, the mainly (50.6%) state owned corporation that manages French airports. Vinci has an 8% shareholding.(https://en.wikipedia.org/wiki/Paris_A%C3%A9roport#Assets_managed_by_ADP. Huillard gets a fixed annual salary of €1 million, plus a “short term” variable bonus of up to 1.6 times his fixed salary supposedly depending on performance, plus a “long term” bonus paid in Vinci shares, as well as other expenses. In 2015 Huillard’s cash bonus was €1,318,646, his share bonus was valued at €1,097,393, and his use of a company car was valued at €4,064. So his total pay in 2015 was €3,420,103. Has worked for Vinci since 1992. He is also President of the Association des Sociétés Françaises d’Autoroutes (ASFA) and Chairman of the non-profit organisation Aurore (of which Huillard is vice chair.) Graduate of the Institut d’Études Politiques de Strasbourg (IEP Strasbourg) and of ENSPTT, France’s national school of posts and telecommunications, began starting career in corporate communications for La Poste (French postal service). He was a career diplomat and civil servant, particularly in the area of French economic and business affairs, after graduating from the Institut d’Études Politiques de Paris and the École Nationale d’Administration. He then became European Commissioner for economic, monetary and financial affairs (1995-9), before moving into the corporate world. In 2000 he joined the board of French water and waste management multinational Suez Lyonnaise des Eaux, and was made its CEO in 2001. He became Chairman of Vinci in 2006 (in the coup against Zacharias), then took his current role when Huillard was made combined chair and CEO in 2010.
board member, Fondation du Collège de France. Qatar. The emirate’s funding vehicle Qatar Holding, which is a major shareholder, has a reserved place on the board. Its usual representative is Mr. Nasser Hassan Faraj Al Ansari, Director in charge of the Qatari-Diar joint ventures. Thales. Major French multinational weapons company. Board member Pascale Sourisse is Senior Vice-President, International Development, Thales. Total. France’s major oil company. Board member Robert Castaigne is Former Chief Financial Officer and former member of the Executive Committee of Total. Brazilian connections. Board member Ana Paula Pessosa was Chief Financial Officer, Organising Committee, Rio 2016 Olympic and Paralympic Games. She had a career at Brazil’s hegemonic right wing media empire Globo, being Chief Financial Officer of its newspaper division Infoglobo between 2001-11, and has various roles in Rio and Brazilian affairs, as well as being on the board of Rupert Murdoch’s News Corporation. Vinci is not just massive, but also very profitable. In 2016 it made a profit (net income) of €2.5 billion. This was 6.6% of the total €38.1bn revenue, a very healthy profit rate for such a big business. In the previous two years, it made profits of around 5% of revenue. Looking more closely, the obvious fact is that some parts of Vinci’s business are much more profitable than others. Basically, construction and other “contracting” divisions employ over 90% of Vinci’s workers, and bring in the bulk of its revenue: €31.5bn in 2016, of which €13.7bn came from Vinci Construction, €10.2bn from Vinci Energies, and €7.6bn from Eurovia. But on their own these divisions just make a relatively modest profit of €690m. Effectively, they are the “workhorses” of Vinci’s business, providing bulk which helps Vinci win the much more lucrative concession contracts. These are basically a state-funded license to print money. The concessions division made €1.7bn profit last year, two thirds of the company’s total income. The large majority came from Vinci Autoroutes, which runs the French motorway concessions. This brought in a massive €1.42bn profit for Vinci, 56% of its total income, from a revenue of only €5.1bn. That means a profit rate of 27.6%. Or to put it another way: for every four euros drivers pay in tolls, one euro goes straight to Vinci’s profits. The airports division is also extremely profitable, but currently still much smaller than the roads business. It brought in €249m profit last year, from €1.06bn revenue, so a profit rate of 23.6%. Half of each year’s profit goes directly to shareholders, as a 50% dividend policy has been in place since 2006. So: for every four euros drivers pay in tolls, 50 cents go straight to the likes of BlackRock and the Qatari dynasty. Vinci’s activity is still mainly in France, where it gets over half (58% in both 2015 and 2016) of its revenues. But this is changing, as it seeks out more profitable opportunities worldwide. Beyond France, it is most active elsewhere in Europe (25%), with Germany and the UK the next biggest markets, each around 7% of revenues, and Benelux countries (Belgium, Netherlands, Luxembourg) around 2%. There is also growing activity in Americas (6.5%), Africa (3.5%), and “Russia, Asia-Pacific and the Middle East” (5.7%). Vinci had net financial debt of €14bn at the end of 2016 (i.e., what it owes minus what it is owed by others). The large majority of this is owed by the concession businesses (motorways, airports, and more), which are highly leveraged: i.e., they fund these big new building projects by borrowing, expecting to pay the debt back comfortably out of the government-backed income stream to come. Much of this debt involves regular issues of bonds by the specific concession subsidiaries, rather than the group as a whole. For example, the ASF autoroute concession company issued €500m in 10 year bonds in May 2016, then another €1bn in January 2017. In September 2016 Cofiroute issued €1.3bn of new bonds, in a mix of 8.5 and 12 year maturities. Last year Vinci spent €526m on debt finance costs (i.e., interest and repayments). Despite the relatively high leverage (ratio of debt to revenue and capital) of the concessions business, these debts are not considered worrying by analysts and investors. There are two big reasons for this. First of all, the nature of the concession deals — basically a state-guaranteed license to print money — means that it’s highly likely that the profits will keep rolling in and debts will be repaid without problems. Second, the group as a whole is not particularly indebted (2.3x EBITDA, as against 10.5x for the concessions division viewed alone). The contracting divisions, though less profitable, are asset rich and conservatively financed, indeed in some cases net creditors. These points are reflected in the high credit ratings Vinci gets from the Ratings Agencies. It is currently rated A- by Standard & Poor’s and A3 by Moody’s. These are comfortably above the threshold for “investment grade” assets (BBB-) which are widely held by pension funds and other major institutional investors. The bulk of the company’s long term assets are non-tangible: expected future income streams from its government concessions. But it also has about €4 bilion in hard assets — property, plant and equipment. Vinci is formally divided into two halves: concessions and contracting. Each of these has many further subsidiaries, both in France and globally. However, as noted above, concessions and contracting businesses often work together as “joint ventures”. Typically, a concession bid will involve one or more contracting subsidiaries to do the main building work and perhaps maintenance too; the concession subsidiary will then provide ongoing management and book most of the profit. Main contracting divisions: Eurovia (construction of transport infrastructure, also a network of quarries and plants to control its own supply chain); Vinci Construction — a broad umbrella for thousands of worldwide subsidiaries, including nuclear power plants (80% of the facilities in France), hydraulic infrastructure such as canals and dams, waste management (e.g., incinerators, sewage treatment works etc. ), oil and gas pipelines and storage facilities, prisons, offices, luxury hotels and prestigious housing developments; Vinci Energies — wind farms, photovoltaics, energy transport, communication technology and urban management including high frequency radio, C.C.T.V., street and public lighting. A concession is a contract where the “concession operator” (or “concessionaire”) designs and builds a new asset for the “concession grantor”, and then maintains and operates it for a period after it is built. The concession grantor is usually a government or state agency, and the operator a private company. Typical concession deals may be motorways, tunnels, bridges, airports, dams, stadiums, and other major infrastructure. There are different possible financing models. In some cases, the operator is paid by the grantor for operating the assets, e.g., in yearly payments. In many other cases, it collects money from the people using the infrastructure: e.g., by charging tolls for a bridge or motorway, usage fees from airlines using an airport, or ticket fees for a stadium. Or there may be a mixture of both kinds of payment. A “benefit” to the state is that the concessionaire typically raises all the money itself to build the infrastructure, so the government does not have to take resources away from its general budgets or increase national borrowing. However, much like a domestic “hire purchase” agreement, usually this means that the cost is much bigger in the long run. The operating company borrows the money from financial markets to do the work, but then often gets much more in tolls or operating fees than it needs to make repayments, raking in a healthy profit. This is certainly the case in Vinci’s deals. The lucrative core of Vinci’s business is VINCI Autoroutes, which runs over four thousand km of motorways in France, the biggest motorway network under concession in Europe. In all cases, the vast majority of income comes from tolls from motorway users (e.g., tolls bring 97.7% of income for ASF, the biggest autoroute concessions). There is also a small amount of income from other sources e.g., service station royalties, rental of optical fibre networks from telecoms operators. There is no substantial payment directly from the state, except for Arcour (A19), which had grant funding for construction. The autoroute concessions all extend into the 2030s, sometimes beyond. When the concessions expire, the assets are just handed back to the state with no money transaction. There are some clauses under which the state can take back the concessions early, e.g., if there is a serious breach of contract; or by giving one year’s notice and paying the operator a fee to make up for the future income it would have been expected to make. Southern and Western France. Revenue in 2015 €2.8bn. Its main concession expires 2036. It also has the much smaller Puymorens Tunnel concession, a separate agreement, which expires in 2037. South and West of Paris. Revenue €1.3bn. The main concession, the “Intercity network”, covers 1,100 km of motorways, until 2034. There is a separate concession for the “A86 Duplex”, an 11 km toll tunnel west of Paris, until 2086. South-East France. Revenue €713m. Concession expires 2032. The A19 motorway south of Paris, 101 km. Revenue €51m. This concession lasts until 2070, and in this case funding involved a government grant. ASF and Cofiroute are largely funded through major bond issues (also called “medium term notes”, MTNs), typically issued for 10 or 15 years, with outstanding maturity dates between 2018 and 2024. In the past, ASF had state-backed funding from low interest rate loans from CNA (Caisse Nationale des Autoroutes, state road funder) dating from the time before full privatisation in 2006. However, these loans will be repaid by the end of 2018. ASF also has loans from the European Investment Bank (EIB). To look a bit further at the biggest concession, ASF collected 719.5 million toll payments in 2015. 366.5 million were collected by machines in automatic lanes, and 351.9 million by Electronic Toll Collection (ETC) systems, in which cars don’t have to stop but are monitored electronically by the system. Only 1.1 million tolls were still collected manually by human toll guards. In that year, ASF’s toll revenue was €3.44bn. So the average toll payment was €4.77. ASF invested €748m back into the network, spending €184m on building new road sections and €531m on supplementary investment in the existing network. The other main expenses were wages, debt repayment costs, and tax. After all that, it made a net income of €896m: a profit rate 21.40%. Cofiroute’s profit rate in 2015 was rather higher, at 31.84%. In 2014 there was French press coverage about the massive profits made by the privatised highway concessionaires. Vinci is not alone in this: on average, concessionaires were making 20-24% profit. And these profits had been steadily increasing. Also, toll tariffs had risen by 21.7% from 2007 to 2014. In response to the publicity, the French state imposed a tariff freeze in 2015. This came as part of a new “motorway stimulus plan” published in August 2015, which in fact expanded the concessions. Vinci committed to making new motorway investments of almost €2 billion, including widening three existing roads. In return its ASF and Cofiroutes golden eggs were extended to last more than another two years each. To be fair, part of the plan involved Vinci and other concession operators being kindly requested to contribute an “annual exceptional voluntary contribution of €60 million, inflation-linked, over a 20-year period to AFITF, the French transport infrastructure financing agency”, of which Vinci’s share is 55%. Companies also agreed to “create a €200 million fund for the environmental modernisation of transport”, Vinci paying 50%, and to work on some environmental issues and car-sharing. But none of these measures come close to denting Vinci’s autoroute income. In 2016, in fact, Vinci Autoroutes’ profit soared by an extra 28%, from €1.1bn to €1.4bn. Few other countries have the same extremely lucrative opportunities for big toll road deals (yet). And where they do, the market may already be crowded by local competitors. Germany is the one country where Vinci has made serious inroads; but it is getting footholds in other countries with smaller deals. This may involve teaming up with local companies in joint ventures, or even buying up local companies outright. It also typically means using the muscle of Eurovia or Vinci Construction subsidiaries to win big road-building projects, with Vinci Highways then getting the concessions deal. In 2016, Vinci Highways made a number of new international steps, particularly expanding into Latin America and Asia. In August 2016, Vinci Highways bought two companies from the Brazilian group Invepar: LAMSAC, which holds the concession to build and operate the Linea Amarilla expressway in Lima, and collect tolls until 2049; and PEX, operator of the related electronic toll system. LAMSAC also has a concession to build a new 25km toll highway in Lima, In Colombia, Vinci Highways “in partnership with Constructora Conconcreto, was named by Colombia’s national infrastructure agency ANI as future concession-holder of the Bogotá-Girardot motorway”. But perhaps the biggest deal of all could become the new “strategic partnership” signed with the Vietnam Expressway Corporation, the country’s public sector roads agency, in September 2016. This could be Vinci’s shot at duplicating its French golden egg in a new country. In Germany, Vinci (through the Cofiroute subsidiary) is part of a joint venture called Toll Collect, a national satellite toll collection system for heavy goods vehicles. It boasts in the 2015 Annual Report that “the tolls collected on behalf of the German government amounted to €4.4 billion in 2015.” In September 2016, Vinci bought a US company called TollPlus which it describes as “a reference in development, implementation and maintenance of dematerialised solutions for Electronic Toll Collection (ETC) operations and customer management.” This company already runs “almost 350 toll plazas” in India. Compared to other areas of its business Vinci Airports is relatively small, but it is also very profitable, with a 23.6% profit rate in 2016. Vinci Airports has 8500 employees and operates in 35 airports worldwide: 13  in France, 10 in Portugal (including the Lisbon hub), three in Cambodia, one in Chile (the Santiago International Airport) two in Japan and six in the Dominican Republic. Together handling more than 130 million passengers a year (up 10% for 2015). Main airports concessions are in Portugal (69% of revenue) then Cambodia (17%) and France (14%) where it runs a network of small regional airports. VINCI Airports is the biggest operator in Portugal, with 44.5 million passengers served, a major player in France where it operates 13 airports, and the only operator of Cambodia’s international airports. In Chile, VINCI Airports, along with Nuevo Pudahuel consortium partners Aéroports de Paris and Astaldi, has been operating Santiago de Chile International Airport since 1 October 2015. This is the sixth largest airport in South America. Although its rate of growth is expected to be slower than that of the past few years, VINCI Airports anticipates continued growth in 2017, particularly it’s operations outside of France. It will benefit from the impact of recent developments in Chile, Japan (where it hopes to increase low cost traffic at Kansai) and the Dominican Republic (where it now runs 6 out of 9 airports) and investments being made in modernising air terminals and their retail areas. Vinci airports are also looking to expand into Iran, having signed agreements with the Iranian government to operate two airports, including one at Mashhad where it hopes to cash in on the 20m pilgrims that visit the area every year. Vinci operates Nantes Atlantique Airport, large for a regional airport. It is used by 4.2 million passengers a year and growing (in 2014 it had 5.8% growth in passenger numbers and has more than doubled in the last 10 years), and is mainly served by low cost and charter flights to European destinations. Further expansion of the airport is limited due to its proximity to the city. Aéroport du Grand is the planned new airport, intended to be situated 30 km (20 mi) to the north-west of Nantes in the commune of Notre-Dame-des-Landes (and La Zad, see below) and to replace Nantes Atlantique Airport. The project to build the airport is a public-private partnership between the French Government and Vinci (the contracted company). The airport was approved in 2008 but has been and is strongly opposed by local residents and environmental and political protesters. In 2016, a government requested consultation resulted in a 55.17% vote in favour of the airport. Eviction of the land has been ordered and is expected to take place imminently. The project dates back to the early ‘60s with opposition starting in the ’70s, when the local population heard about the plans. A combination of the oil crisis and strong opposition led to the project being suspended. However, in 2000 it was recovered under the Lionel Jospin government, and was approved by declaring it of “public interest” in 2008. Various other infrastructure is also planned, including high speed train lines. Opposition is diverse, including farmers, local residence, environmental and other political protesters. Resistance gravitates around a huge squatted 4000 acre protest site named “La Zad”. 115.5 M€ by the “collectivités territotiales”. The SMA is a collective of local government bodies involved in the project. It has 22 members, but only 6 of them are ‘co-financing partners’ responsible for funding and monitoring the concession. 2 régions : Bretagne* et Pays de la Loire* 5 départements : Loire-Atlantique*, Ille-et-Vilaine, Morbihan, Mayenne et Maine-et-Loire 5 agglomérations : Nantes Métropole*, CARENE*, CAP Atlantique*, Rennes Métropole et Angers Métropole 10 communautés de communes : Erdre et Gesvres, Coeur d’Estuaire, Loire et Sillon, Région de Blain, Région de Nozay, Pays de Pontchâteau Saint-Gildas-des-Bois, Secteur de Derval, Castelbriantais, Pays d’Ancenis et Pays de Redon. Vinci is moving into a number of other concession areas. Currently these are negligible in terms of Vinci’s revenues and profits, but they could become opportunities for new growth alongside highways and airports. Vinci’s first big rail concession in France is the “South Europe Atlantic” (SEA) 302 km high speed line between Tours and Bordeaux, which is scheduled to open in 2017. A consortium led by Vinci contracting companies built the line. It will be maintained and operated as a concession by a company called MESEA, which is a new joint venture between Vinci Concessions and French rail engineering specialist Systra (itself a joint venture between Paris Metro company RATP, French railway network SNCF, and various French banks). Other rail projects include the Rhonexpress light rail system in Lyon, a 30-year concession, and a freight link in Antwerp (Belgium), where Vinci has 30% of a maintenance concession lasting until 2050. Another recent rail deal is the “GSM-Rail” concession to install and operate a telecoms network across the SNCF network, involving over 2000 radio transmitters connecting train drivers and control centres. Vinci Energies did most of the work, and now Vinci Concessions has a 25% share in a joint venture called Synerail which has the operating concession until 2025. Vinci’s Stadium division currently manages four stadiums in France, including the Stade de France in Saint Denis outside Paris, and also the Queen Elizabeth Olympic Park stadium in Stratford, London. Like other concessions, the basic model is: Vinci builds the stadium for the government, then gets to manage it and take the proceeds for a period of usually 25 or 30 years. Another new business line is dams: Vinci has a contract with the French rivers authority to automate 29 dams on the Meuse and Aisne rivers. Vinci was once well known for operating a big car park network, including many of the central car parks in Paris as well as across Europe and also in the US. In 2014, Vinci sold most of its car parks subsidiary Vinci Park to two new shareholders, Ardian and Crédit Agricole Assurances. These two companies bought 37% each, leaving Vinci with 25%. The company was renamed Indigo. Vinci sold its remaining stake in Indigo in September 2016. Although the big profits come from the concessions, in order to seize these golden opportunities Vinci draws on a wide array of other business units, from big construction and maintenance divisions to “cutting edge” design and research teams. These subsidiaries can serve as contractors or joint venture partners to the actual building work in concession deals. They may also help the company develop recognition and business or political relationships that may be crucial, particularly when expanding into new areas and bidding for new deals. Vinci’s Contracting division includes thousands of subsidiaries operating under many different local identities. They are grouped under three main sections: Eurovia, which specialises in building and maintaining roads and other transport infrastructure; Vinci Construction, the biggest division by workforce and revenue, which includes many more or less independent general or specialist construction firms; and Vinci Energies, which in fact involves much more than energy infrastructure, including high-tech research units working in fields such as bioengineering or “smart” infrastructure design integrating new data and surveillance tech. Eurovia builds and maintains roads, train lines, tramways, airports, and other transport infrastructure, working for Vinci Concessions and for external clients. It also controls as much as possible of its own supply line including its own quarries (400 of them at the end of 2015), asphalt plants (327), recycling plants, research laboratories, etc. It has a whole range of support services such as PPP (Public Private Partnership) consultancy, design, maintenance, and more. 47% of the business (by revenue) is in France, 33% elsewhere in Europe, and 20% in the Americas. Altogether it has offices in 15 countries, and a network of over 1,000 divisions and subsidiaries. Eurovia is proud of its work on its “Smartvia” road and rail technologies, which incorporate data sensors into roads and track to continually monitor and assess the infrastructure’s condition. Other “new generation” projects include the “Novatherm” energy producing pavement prototype, which captures geothermal and solar energy. Key projects in France include work on various parts of the “Greater Paris” scheme, such as massive transport infrastructure expansion in the Parisian periphery, as well as ongoing road building projects, often on Vinci concessions. In the UK, Eurovia has several road maintenance contracts. Its most high profile UK project is the 25-year PPP scheme for London Borough of Hounslow, a joint venture with Vinci Concessions. Eurovia’s core French roadbuilding activity is relatively stagnant, although the projected new motorway stimulus package may give a boost. It is targeting as growth areas: rail business; expansion in North and South America; further expanding the range of “upstream” and “downstream” products — infrastructure design, and services; strengthening integration with Vinci Concessions. Eurovia’s net income (attributable to parent) was €160m in 2016, up from €146m in 2015 – I.e., a profit rate (as proportion of revenue) of around 2% of its revenue (€7.59 bn). That is, the business basically just ticks over. But, working in joint ventures with Vinci Concessions, it helps support the very sizeable profits made there. The quarrying operations are run by a subsidiary called Eurovia Stone, set up in 2008, which oversees all of its majority- and minority-owned quarries in Europe. According to Eurovia, these “secure its supply” and “ensure that it can produce as much as it consumes”, with an annual production of 70 million tonnes. Eurovia UK asphalt plant controversy in Isle of Wight 2013. Another essential raw material is asphalt. In the UK, asphalt production is run by a subsidiary called Eurovia Roadstone. In sheer bulk, construction is much the largest of Vinci’s sections: it turned over €13.68bn in 2016. But income was only €194m, under 1.5% of revenue. Like Eurovia, the construction business basically ticks over whilst helping support the highly profitable concessions arm. general building 41%; specialist activities and complex projects 35%; civil and hydraulic engineering 24%. Just over half of the business (52%) is in France. The UK is the next biggest market, 13% of revenue. The rest of the business is spread over the Americas 9%, Africa 7%, Asia and Russia 7%, other Europe 7%, rest of world 5%. Revenue has declined over the last two years, which is attributed to general economic decline in France — and in oil producing countries, as oil and gas sector construction is an important part of the business. There was some growth with wider international acquisitions and with specialist activities in Europe and the Americas. Like other Vinci subsidiaries, there will often be joint ventures supporting concessions and other business lines. E.g., Vinci Concessions has taken over Santiago airport in Chile, and Vinci Construction Grands Projets does the building work to extend the airport structures. There is also crossover with Eurovia, particularly concerning “Grands Projets” – e.g., on the recently completed SEA Tours–Bordeaux high-speed rail line. Although probably the bulk of Vinci Construction projects are independent of concessions and other businesses. Even then, this can be about “relationship building” in particular local areas, e.g., a prestige building scheme in one country may help create a reputation and connections that could later lead to concession deals. Vinci Construction has multiple subsidiaries, in different countries and across France, operating under many different names. The list of highlighted projects at the end of this report gives many examples of local operations. Vinci construction is France’s largest building firm in a market worth some €200bn. Its main competitors are Bouygues Construction, Eiffage Construction, Fayat and Spie Batignolles. Vinci France has 391 local bases, but operates under many different historical names. For example, the subsidiary responsible for demolishing the Calais jungle is called “Sogea Nord Hydrolique”. As well as Vinci Concessions, construction subsidiaries may often work with the Adim network of development subsidiaries or Vinci Immobilier. Apart from France, the UK is the only market to have an independent business division that does not come under “Vinci International”. Much of Vinci Construction’s operations go under the name of its subsidiary Taylor Woodrow, which it bought in 2008. Vinci has a notable presence in various regions including Central and Eastern Europe (particularly Poland and the Czech Republic), New Zealand (HEB Construction) and Africa. The African division, called Sogea-Satom, has 26 local subsidiaries in 26 countries and a training hub in Morocco called Africa Pro Campus. As well as regional companies, there are the international “Major Projects” and “Specialist Markets” subsidiaries. “The Major Projects Division supports complex and very large-scale projects in France and abroad, encompassing VINCI Construction Grands Projets, VINCI Construction Terrassement and Dodin Campenon Bernard.” In 2015 it completed work on the SEA Tours–Bordeaux high-speed rail line. There are a number of large subsidiaries that construction work in specialist fields, particularly involving for energy infrastructure. They include: Soletanche Bachy and Menard (geotechnical engineering); Freyssinet and Terre Armée (structures); Nuvia (nuclear); and Entrepose Group, including VINCI Environnement (oil and gas and renewable thermal energy). This is Vinci’s property development business. It currently appears to work almost entirely in France, both Paris and regions, although in 2015 it took on a joint venture in Monaco. In 2016, it brought in €774m revenue, up 10% on 2015. There are three sub-divisions: residential property development, mainly building and selling large apartment blocks; business property, building and selling or leasing mainly office complexes and hotels; and property services / property management,e.g., office complex management (including for other Vinci subsidiaries), and a joint venture called Ovelia which runs “retirement communities”. VINCI Energies provides energy engineering services such as industrial mechanics, thermal engineering, information networks, power transmission, solar farms, and telecommunications infrastructure. It works on renewable energy, smart buildings, transport technologies and systems and urban innovation. -Digital technologies (such as telecommunications infrastructure). Axians (information and communications technology). The companies’ corporate strategy is focussed on profiting from emerging issues such as the ”energy transition” (mainly providing energy infrastructure and efficiency services such as improving building insulation) and the “digital revolution”, including the development of infrastructure, production services and “smart” buildings and cities. Vinci energies are particularly keen on pushing idea of “smart cities”. Promoted as efficiently designed city infrastructure for improving transportation, environmental performance and “urban living”, the concept is more about a cybernetic approach to the city, with measured and controlled inputs and outputs and an increasing intrusion of corporate power into urban life. Smart cities represent a kind of digitised panopticon where things become increasingly tracked and controlled using RFID tags, smart phones, drones and sophisticated surveillance technologies. Many of Vinci’s business areas and practices are highly controversial. Its basic work areas — motorways, airports, quarrying, deforestation, urban development, etc. — cause massive ecological destruction. In France, Vinci is also controversial for hoovering up mega-profits from the privatisation of the country’s transport infrastructure. Elsewhere, its pursuit of profit and growth has led to union-busting, close relationships with authoritarian regimes (particularly major shareholder Qatar), and allegations of practices including corruption and the use of forced labour. Vinci makes some efforts to counter this “reputational damage” and win a more acceptable image through various philanthropic and “corporate responsibility” schemes, e.g. sponsoring NGOs or cultural and sport initiatives, creating foundations and partnerships with universities and other “civil society” bodies. Of course the social relationships and financial dependencies created by these partnerships are also good for business in many other ways, e.g.. using university partnerships to recruit students and develop new technologies, or using sponsorship deals to help win new contracts. Here are just a few examples of Vinci “corporate social responsibility” schemes noted in the 2015 annual report. Member of “Club France Développement Durable”, a “similar network for promoting French civil society’s contribution”. Vinci sponsors the Chair of Eco-design of Buildings and Infrastructure at ParisTech. This agreement renewed in 2013 for a further five years with a budget of €4 million. VINCI was “active in the creation of” Open Innovation Institute of the École Centrale de Paris school of engineering science, and Eurovia is supporting the institute’s Smart Mobilité project. Other projects to identify “innovation” and useful research ideas in 2015 included the Berlin StartupBootCamp; the VINCI Startup Tour in November 2015; and Vinci Concession’s “Hackathons”. Vinci has a network of 11 foundations focused on “social integration”, which sponsor projects run by non-profit organisations. Vinci employees are also encouraged to volunteer time or sponsorship. Two new foundations were set up in 2015 in UK and Spain. In 2016 the Vinci UK Foundation gave £170,000 funding to 19 projects. In Africa: “the Issa (Sogea-Satom Initiatives for Africa) programme financed 27 economic development and social initiatives for total funding of over €400,000. The Group also supported the creation of the Fondation Energies pour l’Afrique”. 2015 sponsorship deal with Paris Football Club (PFC), a low division team that split from Paris Saint Germain. This involves various youth and community coaching schemes, etc. Trajeo’h is a “non-profit created by VINCI to facilitate the recruitment of disabled people and the redeployment and retention of Groupemployees unfit for duties” in France. The ViE social enterprise assists “long term unemployed” people get careers at Vinci companies and partners, with schemes such as “integration through work” contracts. Eurovia quarries hold regular open days. In response to Qatar forced labour allegations, the “independent association BSR was contracted to perform a Human Rights Impact Assessment” of Vinci’s Qatari operations. VINCI Autoroutes partnership with Bird Protection League (LPO). Renewed in 2015 for another three years. Vinci’s shares dropped by some 19% as the fake news spread. However, Vinci soon announced that the release was a fake and reassured the markets, and shares had recovered to end only 3% down by the end of the day. It is unlikely (?) that there was a long term effect on either the company’s value or reputation, although it certainly had markets rattled for a day. NGOs (Sherpa and Bankwatch) and activist groups have brought two court cases against Vinci for alleged corruption relating to the award of the Russian M11 motorway concession through the Khimki forest. These are a “preliminary investigation” by the Nanterre public prosecutor opened in 2013; and a new case opened in May 2016. The public prosecutor of Nanterre (district outside Paris, which covers Vinci’s head office) opened an investigation in April 2015 into allegations of forced labour by Vinci’s Qatari subsidiary, following submission of evidence compiled by the NGO Sherpa. Vinci counter-sued in another Paris court for defamation. The two cases are still continuing (as of December 2016). Vinci’s 2016 half year financial reports notes the following other law suits ongoing as of 30 June 2016. “King County, the county seat of which is Seattle, Washington (United States), is in dispute with a consortium in which VINCI Construction Grands Projets has a 60% share, the purpose of which is to perform a contract for the construction of two underground tunnels known as ‘Brightwater Central’. Because of particularly difficult geotechnical conditions and changes to the initial contract terms, it was not possible to complete the work as set out in the contract, and this resulted in delays and cost overruns.” The consortium has already paid damages to King County under an earlier court ruling, but is continuing to appeal them. Mar 2013: Construction vehicles burned at site near Moscow providing sand to road construction in Khimki. Jul 2012: Construction vehicles burned to prevent tree cutting activity. Oct 2016: 20,000 strong demonstration of support to La ZAD, with attendees promising to return and resist any eviction attempt. Feb 2016: 60,000 strong protest against the airport and in support of La ZAD shuts down Vinci motorway. Nov 2012: 40,000 people re-occupy and rebuild La ZAD after ‘Operation Cesar’, involving 2000 armed police failed to destroy the occupation. A planned Vinci built link road between Bexhill and Hastings in the UK was opposed by a site occupation and various protests and direct actions. Vinci offices in Bristol, UK, were attacked in opposition to the construction of the Bristol Life Sciences Centre and the intended development of ‘synthetic life’. This is a very far from complete list of some particularly notable subsidiaries and projects by country. Vinci has literally thousands of subsidiaries and operations in France. These are just a handful of highlights. Vinci has so far played two roles in the border regime at Calais. Local construction subsidiary SOGEA has been contracted to demolish the jungle: the first half of the camp in early 2016; and then the rest in October 2016. Transport construction subsidiary Eurovia is doing at least some of the work in the construction of the new “great wall of Calais” project, as a contractor to the port management company SEPD. Vinci has the concession to build and run the controversial NDL airport in western France, which is currently subject to concerted resistance by the ZAD. Vinci runs over half of the entire French motorway system. This is its main source of income, with a profit rate (as a share of revenue) of over 25%. One of the country’s largest infrastructure projects is a major re-urbanisation of the Paris periphery, involving both building projects and extension of transport and other infrastructure including roads, metro, train lines, etc. A number of Vinci divisions and subsidiaries are involved or are bidding for future work. PPP contract from SNCF Réseau to install and operate a mobile telecommunications network along 11,500 km of SNCF train track, involving over 2000 radio transmitters along the track and in over 350 tunnels. “This network provides communication between train drivers and control centres using the GSM-Rail standard, which is compatible with the European Rail Traffic Management System (ERTMS).” The contract holder is Synerail, in which VINCI has a 30% stake, is responsible for installing. The work was primarily carried out by Vinci Energies. Synerail will operate the network until expiry of the contract in 2025. A light rail system that connects the centre of Lyon and the city’s Saint Exupéry Airport, a 30-year concession. In river infrastructure, VINCI Concessions with Vinci Construction is modernising and operating 31 dams on the Aisne and Meuse rivers in France under a public-private partnership contract. Vinci Construction is renewing the pretreatment unit at the Seine Aval wastewater treatment plant, Europe’s largest, in Achères. Eurovia has a massive network of quarries, asphalt plants, recycling plants, etc., to produce the raw materials it needs for road building and other transport infrastructure. Vinci Stadium (a part of Vinci Concessions) operates the Stade de France in Saint Denis, near Paris, the Matmut Atlantique in Bordeaux, the Allianz Riviera in Nice and the MMArena in Le Mans. In the UK, VINCI Stadium has been operating the Queen Elizabeth Olympic Park stadium in London since 2015. The UK and Germany are Vinci’s biggest markets outside France, each bringing in 7% of group revenue. Vinci Construction is particularly big in the UK, which is the only country except France to have an independent business division Vinci Construction UK that is not part of Vinci Construction International. This includes the major Taylor Woodrow subsidiary. Vinci has not yet made big inroads into UK transport infrastructure concessions, and toll roads are not yet widespread in the country. However, it has a few local toll-based concessions, and we can assume that it would be keen to multiply these if the UK government could be persuaded to open up more of the road network to concession models. Vinci Concessions is a shareholder in Severn River Crossing (SRC), which operates the two toll bridges over the river Severn, near Bristol and Cardiff. The most recent bridge was built by Vinci. Cofiroute UK, a Vinci Highways subsidiary, collects the tolls. Vinci Concessions has a 50% share in the company operating the road bypass at Newport, South Wales. Vinci Highways has a 25-year PPP contract (started 2012) to upgrade and maintain roads, pavements and street lighting in the west London borough. Works and maintenance are done by Ringway, the UK subsidiary of Eurovia. roads, 767 km of pavements and over 12,000 street lights. Works and maintenance are done by Ringway, the UK subsidiary of Eurovia. VINCI Stadium has been operating the Queen Elizabeth Olympic Park stadium in London since 2015. Vinci’s new luxury and “prestige” building subsidiary called PLENDI has a 60 million contract to extend and refurbish the London Mandarin Oriental 5 star hotel, announced on 14 October 2016. Vinci Construction often operates under the subsidiary Taylor Woodrow in the UK. It has many construction projects including working on Crossrail and underground expansion in London. Vinci Construction UK and Vinci Construction Grands Projets are building “a section of the M5 motorway southwest of Birmingham in a joint venture with VINCI Construction UK, which will include innovative “smart motorway” functionalities”. Vinci Construction facilities management has contracts for US military bases in the UK, as well as other clients including hospitals (Queen Elizabeth, Walsgrave), local authorities (Lincolnshire), shopping centres (Dixon), and the London royal parks. Vinci Construction Grands Projets is building the “East works package of the Thames Tideway Tunnel project in London (a £605 million contract won in a joint venture with Bachy Soletanche Ltd — another Vinci subsidiary)”. Contracted by Barberry developments in January 2017 to build 1,116 student room development on site of old Royal Mail sorting office in Coventry. Five 17 storey tower blocks will transform the city landscape. Across the Gulf of Corinth between the cities of Rion and Antirion, linking the Peloponnese to mainland Greece. Vinci concessions is a partial shareholder. It built the bridge and now operates it. and two sections totalling 215 km in Albania, as part of the TAP (Trans-Adriatic Pipeline) project”. The Vinci company involved is called Spiecapag, which is part of the Entrepose subsidiary that specialises in oil and gas construction work. The Greek section contracted to Vinci runs between Kipoi and Kavala. Liefkenshoek underground rail link, which is used solely for freight transport in the Port of Antwerp. VINCI Concessions is the leading operator of motorway concessions in Germany and holds stakes in the three concession companies operating sections of the A4 (45 km between Gotha and Eisenach, in Thuringia), the A9 (46.5 km between Triptis and Schleiz, also in Thuringia) and the A5 (60 km between Offenburg and Karlsruhe, in Baden-Württemberg), after having upgraded and widened the infrastructure. VINCI Concessions is also a shareholder, via Cofiroute, in Toll Collect, which installed the satellite-based toll collection system for heavy goods vehicles. Vinci has the concession for 10 airports, including Lisbon International, through a wholly owned subsidiary called ANA. Vinci Construction’s local subsidiary is Warbud. It has new contracts to build a 900-bed university hospital in Krakow, two office and retail complexes in Gdańsk and Wrocław and a section of the S2 southern bypass in the capital. Vinci Construction has built the structure enclosing the damaged Chernobyl reactor. Vinci has been involved in building various stages of this motorway project, in joint ventures with other (Russian) companies. Vinci is a 50% shareholder with Mototrest in a venture called NWCC which built the first 43 km stage of the M11 between 2009 and 2014. In November 2014, Two Capitals Highway LLC, signed a 27-year PPP concession to build, operate and collect tolls on stages 7 and 8 of the M11. This company is owned 40% by VINCI Highways and 60% by other partners including the Russian banking group VTB. In July 2015, VINCI Highways finalised the acquisition of 50% of UTS (United Toll Systems), the Russian leader in motorway operation and toll management. UTS operates on 525 km of motorways, including the M11. Vinci has a 40% share in the operation concession, and is constructing a major expansion of the airport. Building work is being down by Vinci Construction’s Grands Projets division, in “the Group’s largest-ever building project outside France”. Eurovia subsidiary Bitumix has a number of road expansion contracts. Eurovia subsidiary ETF is working on the Santiago metro. In 2015, Vinci Construction bought 20% of Constructora Conconcreto, Colombia’s second biggest construction firm. This was part of an aim “to take on infrastructure building projects in Colombia”. Six of the country’s nine airports are run by the Aerodrom concessionaire under a deal lasting until 2030. Vinci finalised buying Aerodrom in April 2016. “In August 2015 VINCI won the first transport infrastructure PPP to be signed by the province of Saskatchewan.” This is a 30-year contract called the “Regina Bypass Partners joint venture”. Vinci Highways has a 37.5% stake, the partners are Parsons Enterprises (25%), the Connor Clark & Lunn GVest fund (25%) and Gracorp Capital (12.5%). The contract is to build and operate the Regina Bypass around the provincial capital Regina. The construction will be done by a consortium of Carmacks (a Eurovia subsidiary) (18.75%), VINCI Construction Terrassement (18.75%), Graham Infrastructure LP (37.5%) and Parsons Canada Ltd (25%). Work should continue until 2019. Operation will then be managed by a wholly owned Vinci subsidiary. VINCI Highways is also active in the United States through Cofiroute USA, which operates 17km of express toll lanes on the SR 91 urban motorway in California. Eurovia has new contracts (awarded 2015) for $195 million of road works in Florida; also major projects in Georgia and North Carolina. Vinci Construction’s African subsidiary is called Sogea-Satom. Its main activity is road building, but it also specialises in rail, airports, ports, water treatment and other infrastructure. of a 94 km highway section in a mountainous area); and the 64 km Djougou–Wéwé and 140 km Parakou–Béroubouay highways in Benin. A section of the A12 urban motorway in the new city of Lusail (Vinci Construction Grands Projets). NB: the Qatari state is a large shareholder in Vinci, currently owning around 4%. Awarded 2015: €264 million contract for an additional phase (4A) of Line 3 of the Cairo metro, following on from a large number of projects of the same type carried out by the Group in the Egyptian capital since 1981. (Vinci Construction Grands Projets). January 2016: Isfahan and Mashad airport concessions. A 700 metre tunnel on the Shatin to Central Link, extending a metro project currently in progress. (Vinci Construction Grands Projets). In 2015 Vinci Construction bought local company HEB Construction, which specialises in road and other infrastructure work. November 2016: HEB starts work on new “maritime hub” in Tauranga. In February 2015 Vinci bought JP Richardson, “a leading Australian electrical contracting and engineering company”.